Remember this? It seems so long ago. New Year's Day was a day of total lunacy in the Premier League, which was likely because I was unable to watch any of it. I landed in Washington, D.C. for a layover between New Orleans and New York mid-afternoon to see that Spurs had beaten Chelsea 5-3. These are the kind of things that happen when I'm in the air. I followed Arsenal's dreadful 2-0 loss to Southampton on my phone from the airport and I'm only half-happy I wasn't forced to watch it. The other half is unhappy because, well, we're halfway through the 2014/15 season and there has been no consistent indication that this Arsenal team is going to turn it around. Even during all of those other recent seasons where Arsenal have stumbled and bumbled their way to the fourth place trophy, there had been some consistent period of a few weeks where things looked okay. It's hard to argue that the Gunners have had that kind of consistency yet this year. Thursday started 2015 on the wrong foot, but the FA Cup is a different animal; league form goes out the window. It's a competition that brought much joy in the face of league difficulty last season. There's no reason it can't do the same this season. Cup squads are always hard to talk about, especially when it's an early round against a Premier League opponent. That's because it's impossible to get inside the head of Arsene Wenger and know how much of the squad is going to be rotated. 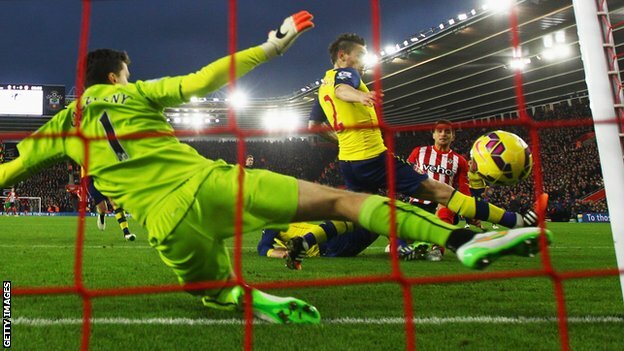 Wenger said after the Southampton match that David Ospina was not on the trip because he would start the cup tie. While it makes sense that the second string goalkeeper would start the match (especially in light of Wojciech Szczesny's nightmare outing on Thursday,) it's still a bit weird that Wenger would opt to bring the third string keeper for the bench, even under those circumstances. It's going to be interesting (read: terrifying) to see how Ospina's dodgy thigh holds up. As for the back line, Arsenal had their four first-choice defenders start for the first time this season on Thursday and they did not look like a first unit at all. Laurent Koscielny is dealing with a chronic problem and Per Mertesacker is exhausted from picking up all of the slack. Still, there's not much room to add youth at this position, considering Isaac Hayden has been dealing with an injury all autumn. Theo Walcott should get his first start of the season somewhere on the right side and up top, one wonders if Chuba Akpom might get a selection, considering Danny Welbeck is a doubt and Olivier Giroud is still suspended; there's been a lot of talk about him of late and he appeared for a six-minute cameo on Thursday. In addition, for the love of God, I would prefer to see Alexis Sanchez get a break. I'm predicting the opposite of rationality below, but it's honestly more likely that the Chilean will start and Akpom will come off the bench. Predicted XI: Ospina, Chambers, Mertesacker, Koscielny, Monreal, Flamini, Coquelin, Cazorla, Oxlade-Chamberlain, Walcott, Akpom. Hull City picked up six of a possible nine points during the holiday period, but the fixture congestion came at a cost. Both Andrew Robertson and Liam Rosenior had to be removed from Thursday's 2-0 win over Everton with chronic injuries; Rosenior came off the bench to replace the injured Robertson, only to be removed later through injury himself. However, both Stephen Quinn and Tom Huddlestone will return to the lineup from suspension. The Tigers will definitely be without Michael Dawson with a hamstring injury, Mohamed Diame (who scored at the Emirates in October) with a knee injury, and Robert Snodgrass, whose season ended with ligament damage on opening day. Hull will not be expected to rotate their squad too much aside from what injuries are already forcing them to do. Predicted XI: McGregor, Bruce, Davies, Chester, Brady, Elmohamady, Huddlestone, Livermore, Meyler, Hernandez, Jelavic. Arsenal's psyche, collectively, is so fragile right now that a discussion of form might just be nonsensical. Every time Arsenal wins two straight, they put in a performance that sets them straight back to square one. After 4-1 wins over Galatasaray and Newcastle, the Gunners were flying high. Then, a 2-2 draw at Liverpool that felt like a loss brought them back down to earth. From there, they scraped together 2-1 wins against QPR and West Ham during the holiday period, seeming to right the ship again, only to come out flat and lose 2-0 to Southampton on Thursday. If it's any consolation, Arsenal have been pretty good lately at following up the bad performances with good ones; they haven't lost consecutive games in over a month! Arsenal have only lost once in their last 10 matches at the Emirates, across all competitions, though that streak includes the 2-2 draw with the Tigers. Hull City entered the holiday period having gone 10 league matches without a victory. After their draw with Arsenal, they also drew Liverpool, then lost to Southampton, Burnley, Spurs, and Manchester United. Draws with Everton and West Brom were then followed with losses to Chelsea and Swansea. Then, on Boxing Day, Hull won 3-1 over Sunderland. Two days later, however, they lost 1-0 to Leicester, giving the Foxes their first win since September. On Thursday, though, they beat a reeling Everton squad 2-0, so, like Arsenal, it's hard to tell which Hull City are going to show up in any given match. Did you know this is a rematch of a game from last year? As you likely know, Arsenal and Hull City are meeting in a rematch of last season's FA Cup Final. In that match, Hull City scored twice within the first 10 minutes and nearly went up 3-0 if it were not for a Kieran Gibbs clearance off the line. Santi Cazorla gave Arsenal a lifeline with a beautiful free kick about 10 minutes later and Laurent Koscielny equalized in the second half to force extra time. In the extra session, Aaron Ramsey scored the winner to avoid penalties, and Arsenal won their first silverware since 2005. The Gunners and Tigers have met once in the league already this season, at the Emirates in mid-October. Arsenal led through Alexis Sanchez, but Hull City equalized just four minutes later, then took a 2-1 lead within the first minute of the second half. Arsenal pressed and pressed but only found an equalizer of their own through Danny Welbeck in second half injury time and both sides settled for a point. The draw ended an Arsenal seven match winning streak against Hull. The clubs will meet at the KC Stadium in the reverse fixture in the beginning of May. This tie will be the fifth FA Cup meeting between the clubs. In addition to last year's final, Arsenal beat Hull in the 2009 sixth round and the 1930 semi-final, which required a replay. Hull's only win over Arsenal in the competition also required a replay. That came in the first round in 1908. I have no funny captions to add here. I'm so sorry. The referee is West Yorkshire-based Robert Madley. This is the first time Arsenal have seen Madley this season. Madley worked two Arsenal cup ties last season: the 1-1 draw with West Bromwich Albion in the third round of the League Cup, which the Gunners won on penalties, and the 4-0 win over Coventry City in the fourth round of the FA Cup. Hull City have seen Madley once this season, for their 1-1 draw at Goodison Park against Everton in early December. Last year was Madley's first in the Select Group, after working his first Premier League match in April of 2013; that match, between Southampton and West Brom, was eventful for Madley, as he sent off three players during West Brom's 3-0 win. All three red cards were arguably correct: Gaston Ramirez was sent off in the 70th minute for catching Shane Long with an elbow to the face (one could debate whether it was accidental or not, however,) Marc-Andre Fortune was sent off for shoving Ramirez in the face during the ensuing melee (Madley consulted with the fourth official for that one,) and Daniel Fox was sent off 12 minutes later for a dreadful two-footed lunge on Steven Reid. John Painting is a contributing writer to The Modern Gooner and probably won't take his Christmas tree down until February. You can follow him on Twitter @zorrocat so you can berate him for that. Bear in mind, the tree is artificial.